↑ 1.0 1.1 1.2 Landsea, Chris; Goldenberg, Stan (2012-06-01). "A: Basic definitions". In Dorst, Neal. Frequently Asked Questions (FAQ). 4.5. Atlantic Oceanographic and Meteorological Laboratory. pp. A11: What is the 'eye'?. ↑ Landsea, Chris; Goldenberg, Stan (2012-06-01). "A: Basic definitions". In Dorst, Neal. Frequently Asked Questions (FAQ). 4.5. Atlantic Oceanographic and Meteorological Laboratory. pp. A9: What is a "CDO"?. ↑ Webmaster (2010-01-05). "Tropical Cyclone Structure". 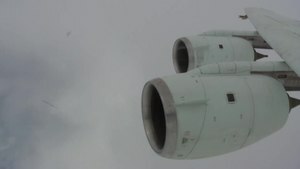 JetStream – Online School for Weather. National Weather Service. สืบค้นเมื่อ 2006-12-14. ↑ Landsea, Chris; Goldenberg, Stan (2012-06-01). "A: Basic definitions". In Dorst, Neal. Frequently Asked Questions (FAQ). 4.5. Atlantic Oceanographic and Meteorological Laboratory. pp. A7: What is an extra-tropical cyclone?. Archived from the original on 2006-06-15. ↑ Velden, Christopher S.; Olander, Timothy L.; Zehr, Raymond M. (1998). "Development of an Objective Scheme to Estimate Tropical Cyclone Intensity from Digital Geostationary Satellite Infrared Imagery". Weather and Forecasting. American Meteorological Society. 13 (1): 172–173. Bibcode:1998WtFor..13..172V. doi:10.1175/1520-0434(1998)013<0172:DOAOST>2.0.CO;2. ↑ Schubert, Wayne H.; และคณะ (1999). "Polygonal Eyewalls, Asymmetric Eye Contraction, and Potential Vorticity Mixing in Hurricanes" (PDF). Journal of the Atmospheric Sciences. American Meteorological Society. 59 (9): 1197–1223. Bibcode:1999JAtS...56.1197S. doi:10.1175/1520-0469(1999)056<1197:PEAECA>2.0.CO;2. ↑ Beven, Jack (2005-10-08). ﻿Hurricane Wilma Discussion Number 14﻿ (รายงาน). Hurricane Wilma Advisory Archive. National Hurricane Center. http://www.nhc.noaa.gov/archive/2005/dis/al242005.discus.014.shtml?. เรียกข้อมูลเมื่อ 2013-05-06. ↑ 8.0 8.1 8.2 Landsea, Chris; Goldenberg, Stan (2012-06-01). "D: Tropical cyclone winds and energy". In Dorst, Neal. Frequently Asked Questions (FAQ). 4.5. Atlantic Oceanographic and Meteorological Laboratory. pp. D8: What are "concentric eyewall cycles" … ?. Archived from the original on 2006-06-15. ↑ Evans, Bill. It's Raining Fish and Spiders. Hurricane Extremes: Google Ebooks. สืบค้นเมื่อ 20 August 2015. ↑ A Dictionary of Weather. Weather Records: Storm Dunlop. สืบค้นเมื่อ 20 August 2015. ↑ Beven, Jack; Cobb, Hugh (2003). ﻿Hurricane Isabel: 6-19 September 2003﻿ (Tropical Cyclone Report). National Hurricane Center. Archived from the original on 14 November 2013. https://web.archive.org/web/20131114014935/http://www.nhc.noaa.gov/2003isabel.shtml. เรียกข้อมูลเมื่อ 2013-05-06. ↑ 12.0 12.1 12.2 12.3 Vigh, Jonathan (2006). Formation of the Hurricane Eye (PDF). 27th Conference on Hurricanes and Tropical Meteorology. Monterey, California: American Meteorological Society. สืบค้นเมื่อ 2013-05-07. ↑ Gutro, Rob (2005-06-08). 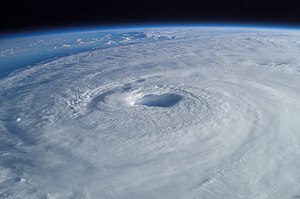 "Ozone Levels Drop When Hurricanes Are Strengthening" (Press release). NASA. Archived from the original on 2012-11-05. สืบค้นเมื่อ 2013-05-06. ↑ Knapp, Kenneth R.; C. S. Velden; A. J. Wimmers (2018). "A Global Climatology of Tropical Cyclone Eyes". Mon. Wea. Rev. 146 (7): 2089–2101. Bibcode:2018MWRv..146.2089K. doi:10.1175/MWR-D-17-0343.1. ↑ Rozoff, Christopher M.; Schubert, Wayne H.; McNoldy, Brian D.; Kossin, James P. (2006). "Rapid filamentation zones in intense tropical cyclones". Journal of the Atmospheric Sciences. American Meteorological Society. 63 (1): 325–340. Bibcode:2006JAtS...63..325R. doi:10.1175/JAS3595.1. ↑ 16.0 16.1 16.2 Montgomery, Michael T.; Vladimirov, Vladimir A.; Denissenko, Peter V. (2002). "An experimental study on hurricane mesovortices" (PDF). Journal of Fluid Mechanics. Cambridge University Press. 471: 1–32. Bibcode:2002JFM...471....1M. doi:10.1017/S0022112002001647. ↑ Aberson, Sim D.; Black, Michael L.; Montgomery, Michael T.; Bell, Michael (2004). A Record Wind Measurement in Hurricane Isabel: Direct Evidence of an Eyewall Mesocyclone? (PDF). 26th Conference on Hurricanes and Tropical Meteorology. Miami, Florida: American Meteorological Society. สืบค้นเมื่อ 2013-05-07. ↑ Kossin, James P.; McNoldy, Brian D.; Schubert, Wayne H. (2002). "Vortical swirls in hurricane eye clouds". Monthly Weather Review. American Meteorological Society. 130 (12): 3144–3149. Bibcode:2002MWRv..130.3144K. doi:10.1175/1520-0493(2002)130<3144:VSIHEC>2.0.CO;2. ↑ Kossin, James. P.; Schubert, Wayne H. (2001). "Mesovortices, polygonal flow patterns, and rapid pressure falls in hurricane-like vortices". Journal of the Atmospheric Sciences. American Meteorological Society. 58 (15): 2196–2209. Bibcode:2001JAtS...58.2196K. doi:10.1175/1520-0469(2001)058<2196:MPFPAR>2.0.CO;2. ↑ Wright, John E.; Bennett, Shawn P. (2009-01-16). "Meso-Vorticies Observed By WSR-88D In The Eye" (Press release). National Weather Service. สืบค้นเมื่อ 2013-05-07. ↑ Wu, Liguang; Q. Liu; Y. Li (2018). "Prevalence of tornado-scale vortices in the tropical cyclone eyewall". Proc. Natl. Acad. Sci. U.S.A. 115 (33): 8307–8310. doi:10.1073/pnas.1807217115. ↑ Hawkins, Harry F.; Rubsam, Daryl T. (1968). "Hurricane Hilda, 1964: II. Structure and budgets of the hurricane on October 1, 1964". Monthly Weather Review. American Meteorological Society. 96 (9): 617–636. Bibcode:1968MWRv...96..617H. doi:10.1175/1520-0493(1968)096<0617:HH>2.0.CO;2. ↑ Gray, W. M.; Shea, D. J. (1973). 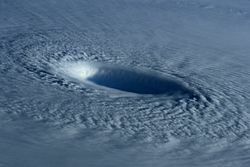 "The hurricane's inner core region: II. Thermal stability and dynamic characteristics". Journal of the Atmospheric Sciences. American Meteorological Society. 30 (8): 1565–1576. Bibcode:1973JAtS...30.1565G. doi:10.1175/1520-0469(1973)030<1565:THICRI>2.0.CO;2. ↑ Hawkins, Harry F.; Imbembo, Stephen M. (1976). 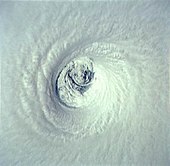 "The structure of a Small, Intense Hurricane—Inez 1966". Monthly Weather Review. American Meteorological Society. 104 (4): 418–442. Bibcode:1976MWRv..104..418H. doi:10.1175/1520-0493(1976)104<0418:TSOASI>2.0.CO;2. ↑ Beven, John L. (2005-10-27). ﻿Tropical Storm Beta Discussion Number 3﻿ (รายงาน). Hurricane Beta Advisory Archive. National Hurricane Center. http://www.nhc.noaa.gov/archive/2005/dis/al262005.discus.003.shtml. เรียกข้อมูลเมื่อ 2013-05-07. ↑ Marks, Frank D.; Stewart, Stacy R. (2001) (PDF). ﻿TRMM Satellite Data - Applications to Tropical Cyclone Analysis and Forecasting﻿ (Presentation). TRMM Workshops. Boulder, Colorado: University Corporation for Atmospheric Research. pp. 7–25. Archived on 2014-01-22. Error: If you specify |archivedate=, you must also specify |archiveurl=. http://www.isse.ucar.edu/trmm/presentations/marks.pdf. เรียกข้อมูลเมื่อ 2013-05-07. ↑ "STORM project" (Press release). National Weather Service. สืบค้นเมื่อ 2008-03-12. ↑ Brown, Daniel; Roberts, Dave. "Interpretation of passive microwave imagery" (Press release). National Oceanic and Atmospheric Administration. สืบค้นเมื่อ 2008-03-12. ↑ Wang, David W.; Mitchell, Douglas A.; Teague, William J.; Jarosz, Ewa; Hulbert, Mark S. (2005). "Extreme Waves Under Hurricane Ivan". Science. American Association for the Advancement of Science. 309 (5736): 896. doi:10.1126/science.1112509. PMID 16081728. ↑ Webmaster (2010-01-05). "Tropical Cyclone Safety". JetStream – Online School for Weather. National Weather Service. สืบค้นเมื่อ 2006-08-06. ↑ Glossary of Meteorology Archived 2012-02-11 at the Wayback Machine.. American Meteorological Society. Accessed 2008-10-10. ↑ National Snow and Ice Data Center. "Polar Lows". สืบค้นเมื่อ 2007-01-24. ↑ Maue, Ryan N. (2006-04-25). "Warm seclusion cyclone climatology". American Meteorological Society Conference. สืบค้นเมื่อ 2006-10-06. ↑ Cappella, Chris (April 22, 2003). "Weather Basics: Subtropical storms". USA Today. สืบค้นเมื่อ 2006-09-15. ↑ Monastersky, R. (May 15, 1999). "Oklahoma Tornado Sets Wind Record". Science News. สืบค้นเมื่อ 2006-09-15. ↑ Justice, Alonzo A. (May 1930). "Seeing the Inside of a Tornado" (PDF). Monthly Weather Review. pp. 205–206. สืบค้นเมื่อ 2006-09-15. ↑ "NASA Sees into the Eye of a Monster Storm on Saturn". NASA. 2006-11-09. Archived from the original on October 5, 2011. สืบค้นเมื่อ November 10, 2006. ↑ Piccioni, G.; และคณะ (2007-11-29). "South-polar features on Venus similar to those near the north pole". Nature. 450 (7170): 637–40. Bibcode:2007Natur.450..637P. doi:10.1038/nature06209. PMID 18046395. หน้านี้แก้ไขล่าสุดเมื่อวันที่ 19 กุมภาพันธ์ 2562 เวลา 03:17 น.